FC Montreal forward Charles Joly scored his first three United Soccer League goals inside the first 40 minutes of play to issue a crushing 5-2 defeat to the Saint Louis FC Wednesday afternoon. Stade Saputo’s turf field was animated by chants and firecrackers as Philippe Eullaffroy’s squad ended the night with its first ever winning streak. 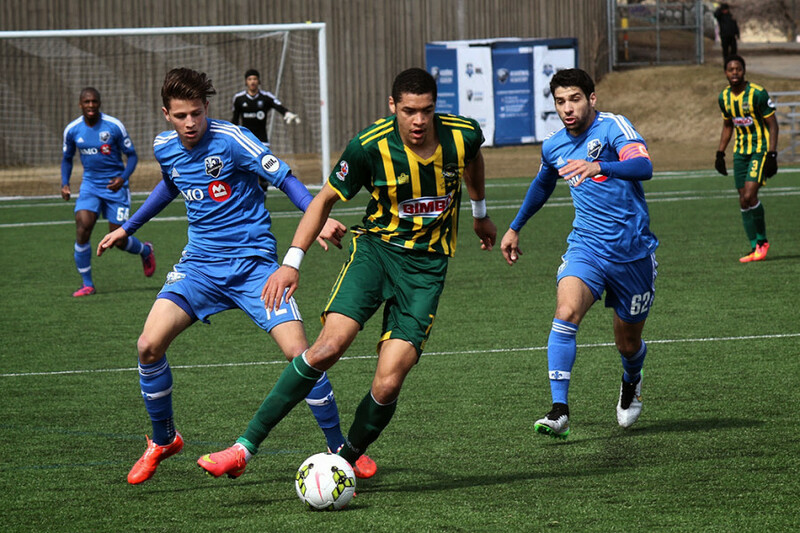 Midfielder Zakaria Messoudi and winger Alessandro Riggi added to Joly’s hat trick, FC Montreal having scored nine goals in their last two games. In the loss, both James Musa and Mike Amberley picked up goals for the visitors. St. Louis FC have an impressive record on the road this season, losing only once before this. The Saints came out strong from the start, and their efforts paid off. In the fifth minute, Musa volleyed a free kick by midfielder Bryan Gaul to open the score. Despite the early deficit, FC Montreal’s faith never strayed. “Despite the fact that we take a goal, there is no panic, we continue to play because we know we are going to have opportunities,” said Eullaffroy about his squad. In the 13th minute, however, FC Montreal’s equalized as Joly scored his first ever USL goal with a low shot past the keeper. Twelve minutes later, fullback Janouk Charbonneau crossed a ball to Joly from the same right side, followed by a teammate’s header straight into the net for his second goal of the day. The man his teammates call “Le Bomber” wasn’t finished yet. At the 40th minute, Joly scored his third goal of the match to get his hat trick and give his team a 3-1 lead. “I’ve never had a game like this at a level this high but I have a lot of good memories. However, this game will be engraved in my memory,” said Joly. Charbonneau couldn’t have been happier to have Joly back in the squad, as the latter was out for six months due to injury. Firecrackers and chants about coach Eullaffroy were heard from the Ultras, the Montreal Impact and FC Montreal supporters group, when the halftime whistle was heard. The home side had a 3-1 lead and were 45 minutes away from a second straight victory. Despite a goal by Mike Ambersley in the second half for Saint Louis, it wasn’t enough for the visitors. FC Montreal added two more goals from Messoudi and Riggi, clinching a convincing 5-2 victory for their team. The squad hopes their recent play will propel their team for the remainder of the United Soccer League season. “What we told ourselves on Sunday was that we were starting the second half of the season, now we have an overall record of 2-0-0 and we are looking forward to the rest,” said Charbonneau. “We are going to show everyone that we deserve better than this last place,” said Eullaffroy. FC Montreal seemingly have the perfect mindset to head into their longest road-trip of the season. In this five-game trip, the bleu-blanc-noir will have games in Toronto, Charlotte, Charleston, Louisville and St. Louis before finally returning home where they will play Toronto FC II on Wednesday August 12th at Stade Saputo’s turf field.